I had intended to write today’s post simply about the IFE Compartment Firefighting Special Interest Group in Sydney, Australia. However, the recent keynote presentation at the Fire Department Instructors Conference (FDIC) by FDNY Lieutenant Ray McCormack claiming the fire service needs a “culture of extinguishment not safety” cannot pass without comment. I wonder how much of the commentary on the web is based on quotations pulled from LT McCormack’s Keynote Presentation or simply extension of comments by others. If you want to know what he said, listen to his entire presentation. I disagree with much, but not all of what LT McCormack had to say. One of the memorable quotes from this speech is “Too much safety makes Johnny a poor leader and a terrible rescuer.” What does this really mean? I believe that LT McCormack cares deeply about the firefighters and fire officers he works with and does not want to see them injured or killed. However, he recognizes that there the fireground presents inherent hazards. Completely eliminating firefighter injuries and fatalities on the fireground would require that we not go to fires. On this point, LT McCormack and I are in agreement. LT McCormack indicates that safety should come from proficiency in the craft of firefighting. On this point I substantively agree, but suspect that the LT and I would disagree on the full range of knowledge, skills, and work practices that should be included. For example, while the LT poked fun at air management, I believe that working effectively while maintaining respiratory protection is a fundamental component of effective and skillful firefighting. Introducing the LT, Chief Bobby Halton stated that “Experience without reflection or evaluation is simply interesting”. Reading the stories of firefighters who have died in the line of duty while fighting fires inside burning buildings, I find that the common elements are frequently the same. In some cases, firefighters die because they over extended themselves in attempting to rescue a civilian occupant. However, in other cases they died because they did not recognize and control the hazards presented by the situation. We tend to be reactionary, making policies, rules, and procedures based on prior bad outcomes. However, this practice often fails to address the root cause of the problem. I believe that the concept of two-in/two-out is sound and providing a rapid intervention team (RIT) when firefighters are in a hazardous environment is a solid idea. However, it does not address the root causes of firefighters becoming lost or trapped inside burning buildings. Does this mean that having a RIT is too much safety? I think not. However, failing to ensure firefighters’ knowledge of fire behavior and building construction is too little safety! Safety is not simply about policies, programs, and procedures; it must be integrated into our work practices. This is not to say that we do not need policies, programs, and procedures, but they must be sound and integrated with skillful and effective work practices. LT McCormack undoubtedly recognizes that some civilian occupants lose their lives before the fire department arrives and is not advocating extension of search into areas of the building that contain a fully developed fire. The major question is where to draw the line between offensive and defensive operations. How much risk is acceptable to save a savable life, how much risk is acceptable to save savable property? This is a question that each fire department, each fire officer, and each firefighter needs to answer. Trapped or dead firefighters do not save civilian occupants or property. Firefighters working to save their comrades likewise do not save civilian occupants or property. Working safely allows everyone on the fireground to contribute to our purpose of being there. Too much safety is not the problem. LT McCormack states that an emphasis on safety is based on fear and results in firefighters risking loss of their identity as firefighters and the values of courage, determination, and pride. On these points I disagree. There is a difference between fear and understanding the hazards presented on the fireground. There is a difference between unthinking reaction and well though and skillful tactical action. The values of courage, determination, and pride apply equally to service to our citizens and service to our members. Sometimes it is necessary to say, no, the risk is too great. I suspect that in some of these situations the LT and I would agree and in others we would not. That is the challenge. LT McCormack states “We do not need a culture of safety; we need a culture of extinguishment… If we put out the fire, safety is accomplished for everyone on the fireground”. This is absolutely correct. However, I suspect that the LT and I might disagree about the application of this important concept or how it should be supported. Effective risk management results in saving savable lives while not compromising the safety of firefighters. Search supported by effective fire control and tactical ventilation is more likely to succeed than search that is not. In some cases firefighters should take the fire first, rather than focusing on primary search (as controlling the fire will eliminate the threat to both firefighters and occupants). At the start of his presentation, LT McCormack stated “my name is Ray and I like to go to fires”. Much of what we do is driven by our identity as firefighters and the fact that we enjoy our work. While selfless sacrifice for others is honorable, sacrifice because of thoughtless action or ignorance is simply tragic. “Too much safety makes Johnny a poor leader and a terrible rescuer”. I disagree. Safe performance makes Johnny a good leader and an effective rescuer. Take 30 minutes and listen to LT McCormack’s presentation and give some thought to how you view safety and effective fireground performance. As I mentioned in an earlier post, I am in Sydney, Australia to participate in the Institution of Fire Engineers (IFE) Compartment Fire Behavior Special Interest Group (SIG) International Instructor’s Workshop and present at International Firefighting Safety Conference 2009 which is being held in Sydney and Perth, Australia. I am energized by the unique opportunity to be involved with these two events. In 2008, Dr. Stefan Svensson of the Swedish Civil Contingencies Agency (formerly Raddningsverket or the Swedish Rescue Services Agency), had an idea to invite a number of instructors, fire officers, and researchers with an interest in compartment fires to Sweden. His purpose was to “see what would happen” if he put a dozen or so highly motivated, passionate, and generally opinionated fire service professionals from around the world who share a common interest in the same room for a couple of days. 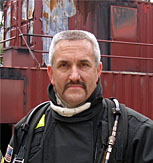 Stefan in an interesting guy, he is a fire protection engineer who conducts research on fire behavior and firefighting operations and teaches at the national Fire College in Revinge. However, he is also an part time firefighter and crew commander assigned to a fire station in a small village outside Malmo, Sweden. I was fortunate enough to be one of those invited to Stefan’s experiment. 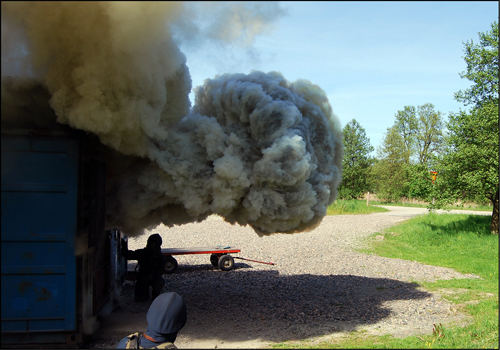 Last spring we traveled to the Fire College in Revinge, Sweden and spent several days listening to presentations participating in a wide range of live fire training exercises and observing demonstrations of fire control techniques and training methods. Interestingly, we found that we had much in common (both personally and professionally) and all learned a great deal. At the workshop we discussed how this collaborative effort could be continued. Shan Raffel from Queensland, Australia, suggested forming a SIG within the IFE as one way to help maintain momentum and provide an means to bring the range of fire service professionals engaged in research, study, and application of knowledge related to fire behavior. As a significan number of the group were IFE members, this semed like an excellent idea. At the time, Shan was the President of the Australia Branch of the IFE and served as the principle organizer and driving force behind accomplishing this task and bringing the group to Australia for our next meeting. I had an interesting dinner conversation with Stefan Svensson Saturday night. We were talking about the importance of our network, working together, and sharing knowledge. Neither scientists nor firefighters have a complete understanding of fire behavior; both have part, but not the entire picture. However, working together, we are more likely to be asking the right questions and gain an improved understanding. Stefan shared that he had tried to figure out how many firefighters there are in the world. Likely this estimate was far from accurate, but the number is quite large. He observed that many firefighters do not collaborate with others outside their own agency (and in some cases even within their own agency). We puzzled over why this was the case. All of us are engaged in essentially the same types of work (at least in the firefighting domain), we use the same technology (water, hose, nozzles, tools, ladders), and share the same passion for our work. Why is it often so difficult for agencies and individuals to work across borders (local, national, or international)? Over the last year, a number of the participants in the first international workshop have maintained contact and collaborated using e-mail and Skype (free voice over internet protocol voice and video phone). I am equally as likely to collaborate with colleagues in Sweden, Australia, the UK, Croatia, Canada, or Chile as those in neighboring jurisdictions. While it is great to travel, meet face to face and share information, today’s technology provides a great (and considerably less expensive) way to do so. For example, I had never met Shan and John McDonough when Paul Grimwood and I worked with them to write 3D Firefighting: Training, Techniques, & Tactics. We accomplished that task simply using e-mail. I think that with current technology (e.g., Skype) this would have been an easier task. My next post will be following the conclusion of the International Fire Instructor’s Workshop and I will share our experiences and accomplishments. The challenge for you is to look for opportunities to share your knowledge, collaborate with and learn with others and develop a broader community of practice as a fire service professional! The deaths of Captain Matthew Burton and Engineer Scott Desmond in a residential fire on July 27, 2001 were the result of a complex web of circumstances, actions, and events. The Contra Costa County Fire Protection District and National Institute for Occupational Safety and Health (NIOSH) both investigated this incident and have published reports that outline the sequence of events, contributing factors, lessons learned, and recommendations. Readers are encouraged to read the Contra Costa County Fire Protection District Report and National Institute for Occupational Safety and Health (NIOSH) Death in the Line of Duty Report F2007-28. Also have a look at Tim Sendelbach’s post In Their Honor at Firefighter Nation. Early on the morning of July 21, 2007, Captain Matthew Burton and Engineer Scott Desmond were performing primary search of a small, one-story, single family dwelling in San Pablo, California. During their search, they were trapped by rapidly deteriorating conditions and died as a result of thermal injuries and smoke inhalation. Two civilian occupants also perished in the fire. The crews of the first arriving companies (two engines arrived almost simultaneously) faced significant challenges with a report of civilian occupants trapped in the building, flames from the door and a large window on Side Alpha and smoke throughout the structure. The two engines rapidly initiated fire attack, primary search, and placed a blower for positive pressure ventilation. During interior firefighting operations, Captain Burton and Engineer Desmond were trapped extremely rapid fire development in the hallway and bedrooms while conducting search without a hoseline. NIOSH Report F2007-28 identifies eight factors that contributed to the tragic outcome of this incident. NIOSH identified these factors as contributing, not causal factors. This reflects the complex and interrelated relationship between the factors that resulted in the occurrence of extreme fire behavior during primary search operations and inability of the search crew to escape from the building. As you read the reports on this incident consider the contributing factors identified by NIOSH. Do you agree that these factors were contributory; if so, in what way; if not, why not? This final recommendation is extremely significant in that this is the first time that NIOSH has indicated that lack of effective fire behavior training in the US fire service is a systems problem. Fire training is often driven by the need to meet (rather than exceed) minimum standards. This is understandable, given the wide range of competencies required of today’s firefighters and fire officers. However, the need to develop a sound understanding of fire behavior and practical fire dynamics is critical. While this issue needs to be addressed in the professional qualification standards, we should not wait until this is accomplished. Firefighters and fire officers must become (or continue to be) students of fire behavior and develop proficiency in reading the fire and mitigation of the hazards presented by extreme fire behavior phenomena such as flashover, backdraft, smoke explosion, and flash fire. 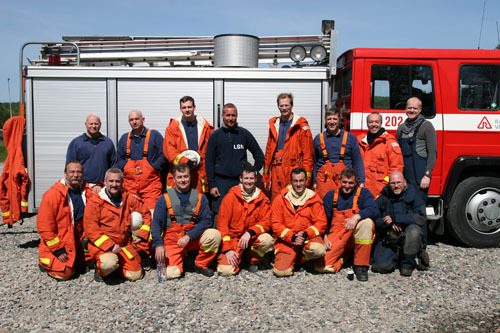 In May 2008 I was fortunate to be one of 12 instructors, fire officers, and fire scientists who met in Revinge, Sweden at the invitation of Dr. Stefan Svensson of R�ddnings Verket (Swedish Rescue Services Agency). Stefan was intrigued by the idea of putting a dozen or so leading fire service professionals with an interest in fire behavior, but divergent perspectives on strategies and tactics in the same room. His research question was to “see what would happen”. Stefan invited participants from Sweden, the United Kingdom, Australia, Poland, Germany, Spain, France, and the United States to this unique event. What happened was that we found tremendous commonality of interest and commitment to improving firefighter safety and fire protection across the world. Surprisingly, while we often disagreed on technical issues and discussion was at times quite vigorous, we left the workshop with greater understanding and a stronger bond. As an outgrowth of our meeting in Sweden, we formed a special interest group (SIG) under the umbrella of the Institution of Fire Engineers. The Compartment Fire Behavior Special Interest Group serves to construct knowledge by integrating fire behavior research, instruction, and practical application. The first meeting of this newly formed SIG will be held 27-28 April 2009 in Sydney, Australia with the theme Finding the Common Foundation. Participants from around the world will be examining compartment fire behavior training principles and practices to find common ground and identify best practices. Immediately following the workshop, the participants will be presenting at the International Firefighting Safety Conference in Sydney on 29 April through 1 May and in Perth on 4-5 May 2009. The conference theme is Protecting the Protectors with a wide range of presentations on fire science, strategy and tactics, and fire behavior training. Additional information and a complete outline of the program is available on the conference web site . Standard setting agencies, states, municipalities, and authorities having jurisdiction should: consider developing more comprehensive training requirements for fire behavior to be required in NFPA 1001 Standard for Fire Fighter Professional Qualifications and NFPA 1021 Standard for Fire Officer Professional Qualifications and states, municipalities, and authorities having jurisdiction should ensure that fire fighters within their district are trained to these requirements. Following the conference, I will publish a series of posts from a CFBT-US case study on this incident and the potential influence of the ventilation tactics used on the extreme fire behavior phenomena that occured. I will be posting on information presented at the workshop conference over the next two weeks. My last post (Gas Explosions) examined flammability and ignition of fuel/air mixtures as related to gas explosions. Deflagration of a fuel/air mixture can result in a significant energy release, when confined, this results in a significant pressure increase. If a confined gas is heated, pressure will increase as indicated in Gay-Lussac’s Law. Gay-Lussac’s Law: When the volume of a gas remains the same and temperature is increases, pressure increases in proportion to the absolute temperature of the gas. Pressure generated in a gas explosion is dependent on the speed with which flames move through the fuel and the degree to which expanding hot gases are confined. The speed with which flames propagate through unburned pyrolysis and flammable combustion products is subsonic (slower than the speed of sound), making this a deflagration. Flame propagation in backdraft may be several meters per second (Guigay, G., Eliasson, J., Gojkovic, D., Bengtsson,L., & Karlsson, B., 2008). The pressure generated by this type of explosion inside a compartment or building can easily break windows (changing the ventilation profile) and in many cases can be sufficient to result in structural damage. When pre-mixed fuel and air is ignited, it pushes unburned bas ahead of the flame, producing turbulence. Flame propagation into this turbulent, pre-mixed fuel will result in an increased rate of combustion, increasing velocity and turbulence even further. This feedback loop results in acceleration of flaming combustion and high pressure from expansion of hot gases. When this reaction is confined (e.g., ventilation is limited to a single opening such as a door or window), pressure can increase to an even greater extent. In an explosion of unburned pyrolysis and combustion products and air, the severity of the reaction will depend on the total mass and concentration of fuel, location of the ignition point, strength of the ignition source, and extent of confinement. While it is not possible to evaluate these factors under fire conditions, understanding the variables aids in understanding the processes involved. For example, as illustrated in Figures 1 and 2, ignition that occurs inside a compartment can expel a mass of unburned fuel which may subsequently ignite (note that the opening may not be to the exterior, but may simply be to another interior compartment, stairwell, etc.). Expulsion of unburned gas phase fuel from a compartment in a backdraft results in a characteristic spherical mass of fuel (as illustrated in Figure 2) which subsequently ignites, resulting in a fireball. How might ignition location have influenced the nature and duration of flaming combustion in the stairwell in the Watts Street incident discussed in 15 Years Ago: Backdraft at 62 Watts Street and 62 Watts Street: Modeling the Backdraft? Explosions and the resulting pressure increase occur extremely rapidly, this makes the force that is applied to structures a dynamic load. How a structure responds to this type of dynamic load depends on the magnitude of the load, design, and condition of the structure before the load was applied. In addition to the pressure generated by an explosion, movement of gas at high velocity also adds to the dynamic load imposed on the structure. Figure 4 illustrates the rapid changes in pressure resulting from an explosion in a compartment. Note: Adapted from the Gas Explosion Handbook (GexCon, 2006). Backdraft and smoke explosion can generate considerably more pressure and flow than is necessary to cause structural damage. Even if the pressure from an explosion is limited, it will generally be sufficient to cause failure of window glazing or damage to other building openings, resulting in a significant change in ventilation profile. When the fire is ventilation controlled, this will lead to increased heat release rate and potential for rapid transition to a fully developed fire. Extreme fire behavior can be categorized as a step event which results in a sustained increase in heat release rate or a transient event that results in a brief increase in heat release rate. Transient events involve combustion of unburned combustion and pyrolysis products. The speed of this combustion process can vary widely depending on the concentration of fuel and oxygen, extent of mixing, confinement and a number of other factors. Transient events may simply involve rapid combustion (e.g., flash fire) or they may be explosive (e.g., backdraft, smoke explosion), resulting in a significant pressure increase within the compartment or building. My next few posts will provide brief overview of gas explosions in general to provide a foundation for understanding explosive extreme fire behavior phenomena such as backdraft and smoke explosion. The Gas Explosion Handbook (GexCon, 2006) defines a gas explosion as a process where combustion of premixed gas phase fuel and an oxidizer (e.g., fuel and air) causes a rapid increase in pressure. The fuel in a gas explosion may result from release of a flammable gas normally used as a fuel or in industrial processes (e.g., methane, cyclohexane) or from accumulation of unburned pyrolysis and combustion products in a compartment fire. An explosion involving unburned pyrolysis and combustion products in a compartment fire may occur in one of two ways: 1) air is mixed with a rich fuel/air mixture and subsequently undergoes auto or piloted ignition (backdraft), or 2) a pre-mixed, flammable, fuel/air mixture undergoes piloted ignition (smoke explosion). Exploring the basic processes involved in a gas explosion will lay a foundation for understanding these two important extreme fire behavior phenomena. Compartment fires generally involve combustion of natural and synthetic organic (carbon containing) materials such as wood, paper, and plastics. In order for flaming combustion to occur, fuel must be transformed into the gas phase through vaporization or pyrolysis. Incomplete combustion of organic fuels results in production of carbon monoxide, soot, and a wide range of other products of combustion (many of which are flammable). Smoke is comprised of not only the products of incomplete combustion, but also unburned pyrolysis products. As illustrated in Figure 1, Smoke is Fuel! Gas phase fuel in smoke may ignite and burn in the plume or ceiling jet or it may burn as it exits through a ventilation opening. However, unburned gas phase fuel may also accumulate inside the compartment or building, mixing with air to form a potentially flammable mixture. In ventilation controlled fires, concentration of gas phase fuel increases and may become too rich to burn without introduction of additional air. In addition, flammable products of combustion and pyrolysis products may infiltrate into uninvolved compartments or attached exposures and mix with air to form a flammable atmosphere. Combustion requires fuel and oxygen in the proper concentration. Under normal conditions, air contains approximately 21% oxygen and 79% nitrogen and trace amounts of other gases. The nitrogen, other gases, and water vapor are passive agents as they are not chemically part of the combustion reaction (but as energy is required to raise the temperature of passive agents, they do influence combustion). At first glance, the flammability diagram in Figure 2 appears to be extremely complex. However, it simply represents the relationship between fuel, oxygen, and passive agents. 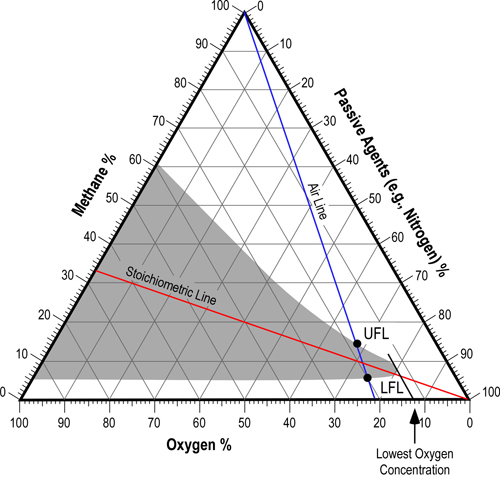 In this triangular diagram, the total of the concentration of fuel, oxygen, and passive agents equals 100%. In the case of Figure 2, the triangular diagram shows all possible mixtures of methane, oxygen, and nitrogen passive agents (predominantly nitrogen in the air). The blue (air) line indicates oxygen concentration from normal 21% (by volume) to 0%. The red (stoichiometric) line indicates the ideal mixture of oxygen and fuel for complete combustion. The gray shaded area indicates the mixtures of methane, oxygen, and passive agents that will be flammable. The area of this diagram that is of greatest interest in most compartment fires is the region to the right of the Air Line (flammable limits under normal conditions and the minimum oxygen concentration that will allow combustion). This is because most compartment fires are dependent on ambient air as a source of oxygen. If the concentration of fuel increases, it must be offset by a corresponding reduction in oxygen and passive agents and may make the mixture too rich to burn. However, if fuel escapes and is replaced with air, the concentration of the mixing gases may reenter the flammable range. The flammability diagram applies to pre-mixed fuel and air (oxygen and passive agents). In a compartment fire, the concentration and mixing of fuel and air varies considerably due to differences in temperature and resulting density of smoke and air. Consequently, there may be pockets of fuel and air that are within the flammable envelope, while other areas may be too rich or lean to burn. The minimum ignition energy for a given fuel generally corresponds to the stoichiometric (ideal) mixture of fuel and air. As concentration increases or decreases within the flammable range, ignition energy increases (i.e., ignition energy at the Lower and Upper Flammable Limits will be higher than for the stoichiometric concentration). The concentration and specific gas species of flammable combustion and pyrolysis products is complex and will influence the energy required for ignition. The concept of ignition energy and the influence of concentration of fuel in air is important in understanding why a flammable mixture of combustion and pyrolysis products may not be ignited by surface combustion, but may be ignited by the higher energy provided by flames. My next post will continue with a look at other factors that influence explosive ombustion in compartment fires. Two incidents recently point to the hazards presented by explosions which may occur during firefighting operations. On March 25, 2009, firefighters in Pittsburgh, Pennsylvania were operating at a fire in a three-story apartment building of ordinary construction when an explosion occurred on Floor 2 while WPXI was videotaping fireground operations. Watch the video and see what you think? A news reporter quotes a chief officer, providing the following explanation: [Backdrafts] occur when a fire causes a buildup of pressure inside a building. When a firefighter enters a pressurized area, an influx of oxygen can cause the fire to explode. Note: comments reported in the press are not always an accurate representation of what was said. While the comments reported are not completely inaccurate, they do not accurately describe the mechanism by which a backdraft occurs. On April 2, 2009, in Cleveland, Ohio an explosion occurred while firefighters were operating at a fire in a 2-1/2 story, wood frame dwelling. The fire, which had originated on the exterior of the structure, extended into the building and to the upper floors through void spaces in the balloon frame walls. According to news reports, the explosion occurred shortly after firefighters conducting primary search opened an attic door. The force of the explosion blew the two firefighters down the stairs to the second floor. Both firefighters received burns to the neck and face. News reports represented the phenomena involved in this event as a smoke explosion or backdraft. Based on the limited information provided in the news reports, which of these phenomena (backdraft or smoke explosion) do you think was most likely? What leads you to the conclusion as to which of these phenomena was most likely to have occurred? A WKYC news report quoted a chief officer as stating “When they opened up the door to the attic that flow of oxygen allowed that fire to ignite, and it actually explodes.” Watch the video of this interview. This is a simple, but incomplete explanation of how a backdraft occurs. However, it does not explain the smoke explosion phenomena. While definitions are often ambiguous and the lines between various extreme fire behavior phenomena are a bit fuzzy, it is useful to examine even the limited information provided in news reports and give some thought to what might have happened. Are reported conditions consistent with the reported phenomena and what alternative theories might explain what happened? In Fire Gas Ignitions and Language & Understanding: Extreme Fire Behavior, I pointed out the ambiguity in definition of terms related to extreme fire behavior. In the structural firefighting context, the term extreme fire behavior is used to identify phenomena that result in rapid fire progression and present a significant threat to firefighters. 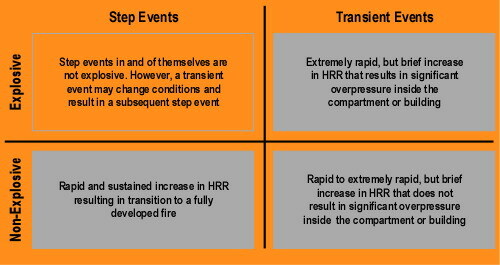 Rapid fire progression may involve transition to a fully developed fire (e.g., flashover) or it may involve a brief, but significant increase in energy release (e.g., backdraft, flash fire, smoke explosion). One way to begin the process of reducing the ambiguity surrounding extreme fire behavior phenomena is to establish a framework for organizing and classifying extreme fire behavior phenomena. Extreme fire behavior involves a rapid increase in heat release rate (HRR). The increase in HRR can be sustained or it may be relatively brief. Brief increases in HRR may or may not result in overpressure inside a compartment or building. Concentration (mass fraction) of fuel in the gas phase influences the nature of extreme fire behavior. Depending on existing or developing conditions, extreme fire behavior may be initiated by reaching critical HRR, an increase in ventilation, or a source of ignition. It is likely that there are additional concepts or criteria that may prove useful in the process of organizing and classifying extreme fire behavior. However, these concepts provide a starting point for this process and discussion. At the highest level, extreme fire behavior phenomena are classified on the basis of the duration of increased HRR. If increased HRR is sustained and the fire enters a (relatively) steady state of combustion, the phenomena would be classified as a Step Event. However, if the increase in HRR is brief and not sustained, the phenomena would be classified as a Transient Event. A rapid increase in HRR results in increased temperature of the atmosphere inside the compartment. As temperature increases, the gas (i.e., air and smoke) volume within the compartment will expand. If the gas volume inside the compartment is confined and cannot expand, pressure will increase, in some cases significantly! 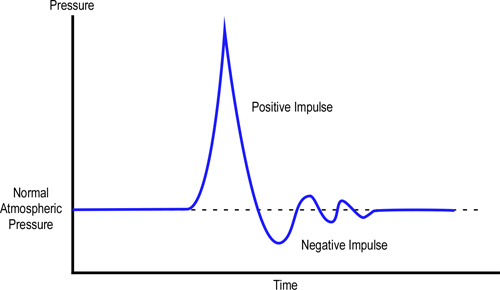 Transient events are classified as Explosive (resulting in a significant overpressure) or Non-Explosive (not resulting in a significant overpressure). Explosiveness is in part a result of the mixture of gas phase fuel and air present in the compartment and the extent to which combustion is confined. Classification of extreme fire behavior phenomena on the basis of outcome are illustrated graphically in Figure 1. Additional clarity can be obtained by examining extreme fire behavior phenomena on the basis of requisite conditions for occurrence. However, it is important to keep in mind that conditions are rarely uniform in structure fires. Different compartments (e.g., habitable spaces, voids) can have dramatically different conditions in burning regime, fuel concentration, oxygen concentration, and temperature. In a compartment with sufficient openings, flashover can occur prior to fire growth becoming significantly limited by available ventilation. However, a majority of extreme fire behavior phenomena occur when the fire is in a ventilation controlled burning regime. As compartment fire development becomes limited by ventilation, not all of the gas phase fuel resulting from pyrolysis is burned. 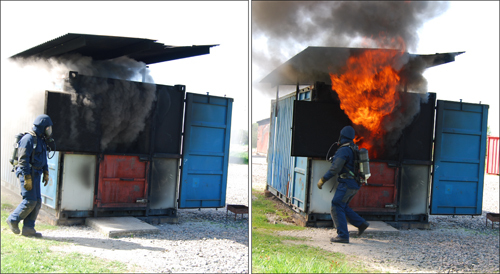 This excess pyrolizate increases both the mass and concentration of fuel within the compartment (and other compartments as smoke spreads through the building). Concurrently, with increased fuel concentration, oxygen concentration decreases. Provided a source of ignition with sufficient energy, gas phase fuel/air mixtures within the flammable range can be ignited. However, if the fuel/air mixture is too rich, additional air must be introduced and mixed with the fuel in order for combustion to occur. The combination of fuel/air mixture and extent of confinement define what type of initiating event (contact with source of ignition, increase in ventilation, or both) will be necessary for the extreme fire behavior to occur. It is often easier to see how things are organized using a visual model or diagram. However, it is not so simple to capture a high level of complexity in a simple drawing. 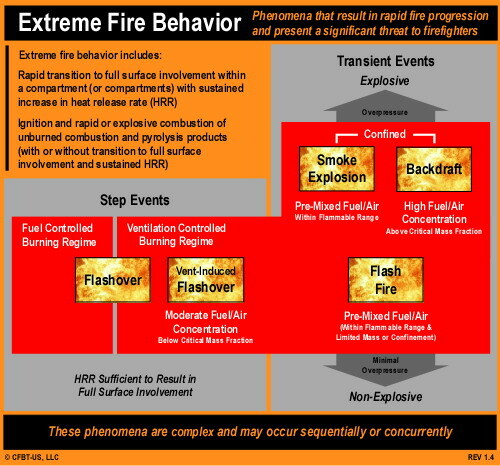 Figure 2 illustrates the concepts presented in this post regarding classification of extreme fire behavior phenomena. This is a work in progress and feedback is greatly appreciated!